Enhanced bcaa formula for muscle recovery and performance paired with added energy and hydration components. 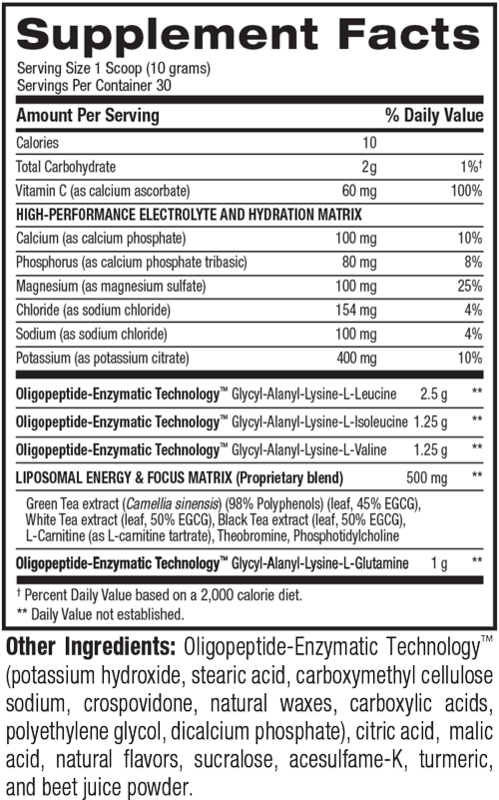 BEST ENERGY BLEND: L-Tyrosine, Green tea extract (leaf), Caffeine anhydrous, Alpha-Glyceryl Phosphoryl Choline (Alpha-GPC 50%). Blueberry Lemonade: Maltodextrin, citric acid, natural and artificial flavors, Oligopeptide-Enzymatic Technology™ (maltodextrin, dicalcium phosphate, stearic acid, carboxymethyl cellulose sodium, crospovidone, natural waxes, carboxylic acids, polyethylene glycol, potassium hydroxide), malic acid, silica, sucralose, acesulfame-K, salt and FD&C Blue No. 1. Rainbow Ice: Maltodextrin, citric acid, natural and artificial flavors, Oligopeptide-Enzymatic Technology™ (maltodextrin, dicalcium phosphate, stearic acid, carboxymethyl cellulose sodium, crospovidone, natural waxes, carboxylic acids, polyethylene glycol, potassium hydroxide), malic acid, silica, sucralose, acesulfame-K, salt and FD&C Blue No. 1. Watermelon Ice: Maltodextrin, citric acid, natural and artificial flavors, Oligopeptide-Enzymatic Technology™ (maltodextrin, dicalcium phosphate, stearic acid, carboxymethyl cellulose sodium, crospovidone, natural waxes, carboxylic acids, polyethylene glycol, potassium hydroxide), malic acid, silica, sucralose, acesulfame-K, salt and FD&C Red No. 40. Sour Candy: Citric acid, natural and artificial flavors, maltodextrin, Oligopeptide-Enzymatic Technology™ (maltodextrin, dicalcium phosphate, stearic acid, carboxymethyl cellulose sodium, crospovidone, natural waxes, carboxylic acids, polyethylene glycol, potassium hydroxide), malic acid, silica, sucralose, acesulfame-K, salt, FD&C Yellow No. 5 and FD&C Blue No. 1. Take one (1) serving (1 scoop) blended into 8oz of ice cold water, during the day, before your workout, or as directed by a qualified healthcare practitioner. On non-training days, take one (1) serving (1 scoop) during the day any time you need a pick-me-up, on an empty stomach, or as directed by a qualified healthcare practitioner. What is Best BCAA™ w/ Energy? Why is Best BCAA™ w/ Energy better? Who should take Best BCAA™ w/ Energy? When should I take Best BCAA™ w/ Energy?